Just out on Blu-ray and DVD, X-Men: First Class is Matthew Vaughn’s clever 1960s-era spinoff from Fox’s popular mutant superhero franchise. Based on the Marvel comics created by Jack Kirby and Stan Lee, X-Men posits a world where the infinite variety of super-powered homo superiors, the next step in human evolution, are being persecuted by the increasingly suspicious homo sapiens — us. 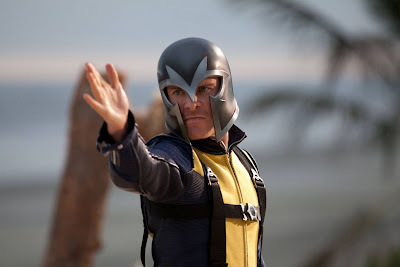 Though the initial two films helmed by Bryan Singer (The Usual Suspects) tied the mutants’ quest for acceptance to the same battle being fought by today’s LGBT community, X-Men: First Class backtracks to its most primal disagreement, the one between its two lead characters. Appropriately enough, the movie this time finds its thematic touchstone in the civil rights struggle: telepath Charles Xavier (James McAvoy), like Martin Luther King Jr., believes humanity will only accept mutants through peaceful coexistence, at least as peaceful as it can be when fighting dastardly super-villains like Sebastian Shaw (Kevin Bacon); Xavier’s friendly rival and master of magnetism, Erik Lehnsherr (Michael Fassbender), is closer in spirit to the more militant Malcolm X, who believed coexistence must be fought for “by any means necessary.” Lehnsherr, the man who would be Magneto, is automatically then a far juicier role, and for Fassbender, a star-making turn. Great piece on a great actor (my current favourite actually). Fassbender is quickly becoming the hottest actor out there, and it is great to see him go back and forth between Hollywood and Indiewood. As for yr comments on the set and costume design of the film in question - I could not agree more. I was thinking Bond at many turns myself. Also, Widescreen looks to be a fun place for all things cinematic. Wish I were part of the fun.